Excelling expectations in their opening engagements earlier on the opening day of play, Friday 1st February, at the Universal 2019 Pan America Cup in Guaynabo, Puerto Rico, Nikhil Kumar of the United States followed by the Canadian duo of Alicia Cote and Jeremy Hazin continued their good form in the afternoon session of play. All continued to upset the odds; all completed their group stage matches unbeaten and thus reserved quarter-final places. Nikhil Kumar set the standard, the no.15 seed, having caused a major upset by beating Mexico’s Marcos Madrid, the no.5 seed, in his opening men’s singles contest (7-11, 11-8, 11-8, 9-11, 6-11, 14-12, 11-6) maintained his good form to overcome the Dominican Republic’s Emil Santos, the no.10 seed. Against Marcos Madrid he had saved two match points in the sixth game, facing the man from the Caribbean, life was less fraught; he prevailed in straight games (11-6, 11-6, 11-8, 11-7). Disappointment for the Dominican Republic, more followed; in the women’s singles event after winning the opening game, Eva Brito, the no.11 seed, was beaten by Alicia Cote, the no.14 seed (4-11, 15-13, 11-4, 11-6, 11-5); the winner earlier in the day when facing Puerto Rico’s Melanie Diaz, the no.8 seed (7-11, 8-11, 11-3, 9-11, 11-5, 11-7, 11-7). Success for Canada was followed by more, Jeremy Hazin, very much the man in form. In his opening contest he had accounted for Chile’s Gustavo Gomez, the no.8 seed (11-6, 11-5, 11-9, 11-7), he followed with a similar straight games success. He beat Puerto Rico’s Daniel Gonzalez, the no.11 seed (11-7, 11-5, 13-11, 11-4). In the remaining second series of men’s singles matches in the group phase of proceedings; Canada’s Marko Medjugorac, the no.13 seed, having earlier in the day lost to the host nation’s Brian Afanador, the no.7 seed (11-3, 11-8, 11-6, 11-8), recovered to beat Chile’s Juan Lamadrid, the 9 seed (11-9, 11-6, 11-8, 11-8). 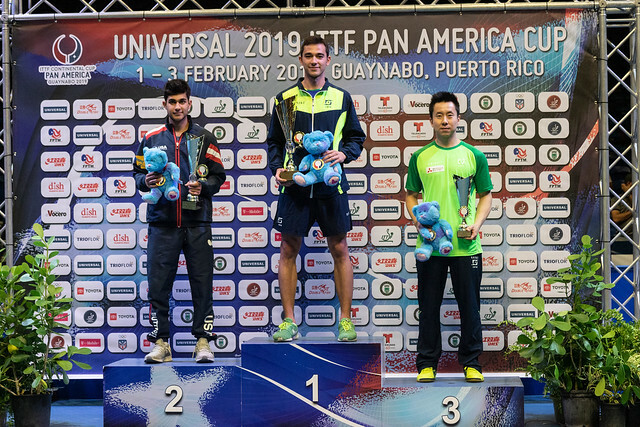 Meanwhile, the Dominican Republic’s Samuel Galvez, the no.12 seed, made a fine start to his campaign in the men’s singles event; he beat Guatemala’s Allan Gutierrez, the no.14 seed (10-12, 11-6, 7-11, 12-14, 11-9, 11-3). Likewise in the women’s singles competition, there was success after disappointment. Chile’s Judith Morales, the no.13 seed, after having lost to Lily Zhang of the United States, the no.5 seed, in her initial contest (11-3, 11-6, 11-3, 11-7) accounted for Guatemala’s Mabelyn Enriquez (11-8, 11-7, 12-10, 7-11, 11-6). One series of matches remains, to be completed later in the day, in each of the men’s and women’s event.